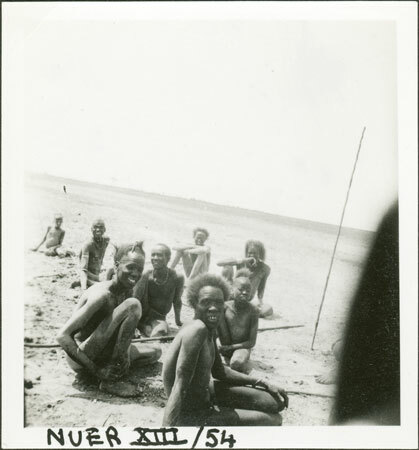 A group of men seated on the ground, possibly photographed from the window of a stationary truck parked in the shade of trees next to Lake Fadoi. A long harpoon used for fishing in the lake can be seen on the ground in front of them, as well as a spear stuck in the ground. Note on print reverse ms pencil - "1 4" & print front border ms ink - "NUER XIII/54"
Morton, Chris. "Nuer men" Southern Sudan Project (in development). 03 Jan. 2006. Pitt Rivers Museum. <http://southernsudan.prm.ox.ac.uk/details/1998.355.627.2/>.